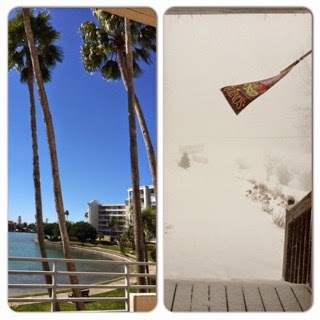 Shew, I am so glad we got back from Florida in time for the snowstorm of 2015. I would’ve hated to miss that. I think my people and I are beginning to tire of each other. After all, we have seen each other within the confines of this house every day for 8 days. All forms of everything have been cancelled – church, college, trips to Starbucks. This is our life – we live in a snow globe. Which is a sugary term for “snow prison”. I warmed up some left-over deer roast for my sandwich for lunch. I’m still measuring my food and watching my weight, so if you’ve ever done this, you know – every morsel allotted to you for the day is precious. He watched me load up my thin, whole wheat round bread with roast, and leave the rest (that wouldn’t fit) on a plate. And then he proceeded to help himself to a few bites. 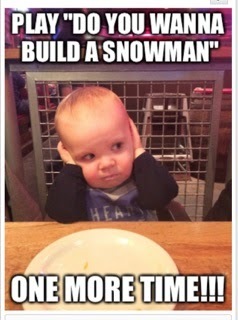 “I’M NOT DONE WITH THAT!! !” I yelled. “Oh, sorry!” He chuckled. And that is not the first time he’s gotten in trouble for that. He went downstairs to his office, returning just about 3 minutes later (he’s full of nervous energy), asked me a question, and apparently I snapped at him. I claim total innocence, but it must have been enough for him to think things were escalating into a fight. He marched right over, took me by the shoulders, and said, “Are you trying to fight with me because I DO NOT want to fight with you today, all I want is a kiss.” That man – his reactions are so funny. He got his kiss. He keeps talking about “Big roll toilet paper”. I noticed it when we got back from Florida – as he switched a roll out, he held up the empty tube to his eyeball and said, “THIS is why they call it “big roll toilet paper!” I just stared at him. “See how BIG this tube is now? !” He complained. “They didn’t put any more paper on the roll – they’ve just made the TUBES bigger, so you’ll buy it thinking you get more toilet paper, but you DON’T!! !” I tried to look mollified. I guess I didn’t do a good enough job, because every time he changes a roll, he holds it up to his eyeball and says the same thing all over again. 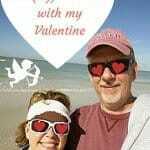 I am so glad Jim is home right now, because there is so much that can go wrong during a snow storm, and it has. 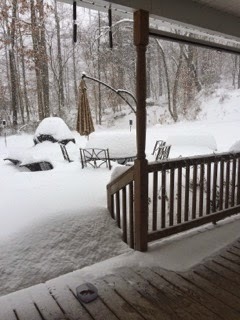 We oversee the care of mom and dad and their place (since it is attached to ours), and about 4 days into the 8 day storm, one of their commodes stopped working due to a frozen pipe. This pipe happens to be behind a wall in the garage (which was freezing), so the best thing to do for the present was to purchase some portable heaters for the garage in order to hopefully thaw out the pipe. Thank goodness Jim dug out the snow blower the day before and worked the driveway so he could drive to town to find heaters. This man. When will he ever learn. When I say I’m going to go somewhere, I have to decide what I’m going to look like. I’ve always heard that every time you leave the house you should look like you’re getting ready to meet someone because chances are if you don’t – you will. 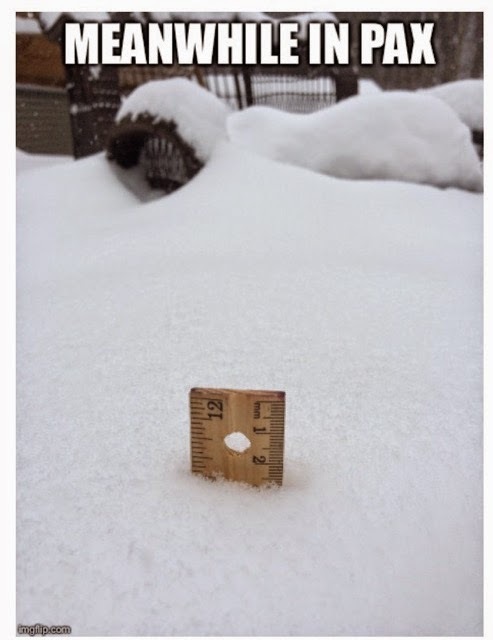 Of course this means that I did not leave in my snow storm slouch clothes – I changed my clothes, popped in my contacts, and applied a bit of makeup. Actually, he does know this about me. He calls it my “Eight Things”. According to him, before I go anywhere or change gears from what I’m busy with at home, I always do “Eight Things”, and that is what takes me forever. It’s a family joke. When we decide to go downstairs to the basement and watch a movie in our TV room, the kids will ask, “Where’s mom?” “Oh, she’s doing her ‘Eight Things'”. 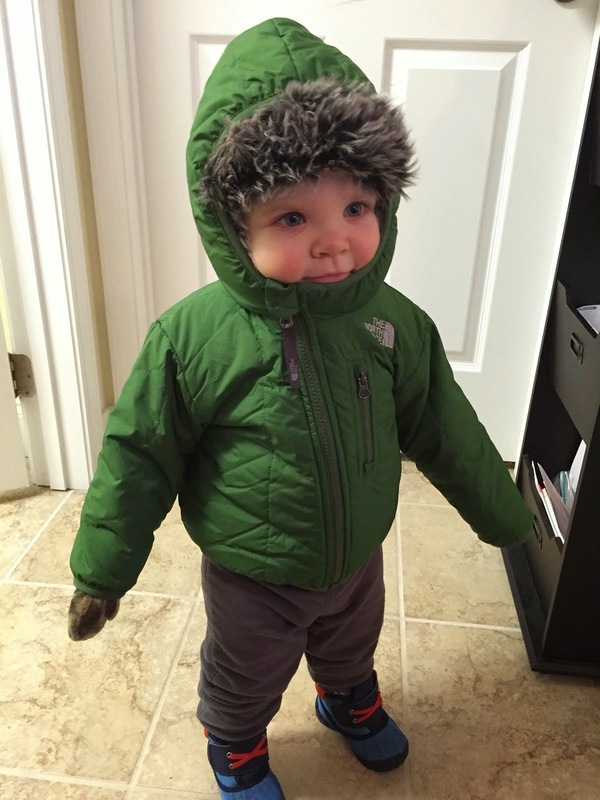 Or everyone decides to go outside for a walk – “Where’s mom?” “She’s doing her ‘Eight Things'”. Later on during snow storm week, we broke Taryn out of her house to come spend the day with us – that girl is someone who can not be home for days on end without social contact and she was pretty much at the end of her rope. (She had texted me earlier in the day and said, “Is this gonna be forever?!”.) She and Kylie decided we should play Phase 10. I got up from my puzzle, went to the kitchen, and started eating an orange, because I’d already planned to have a snack before I did anything else (back to the food allotment and not letting myself get too hungry so that I overeat later). “Mom! What are you DOING right now, we are ready to play this game!” Taryn exclaimed. “Mom’s gotta do her ‘Eight Things’, Taryn, you know that!” Jim piped up from the family room. Yeah, that’s probably also going to be on my tombstone – “SHE DID EIGHT THINGS BEFORE SHE DIED”. Anyway, back to the search for heaters. We stopped at Lowe’s – all heaters were sold out. Next up – Walmart – same thing. Jim gave up. “Well, we can’t be this close to our grandson and not visit him” he remarked. 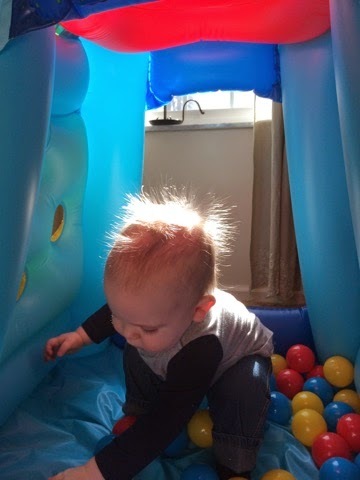 I agreed, we must go see the little booger, whom we had quite missed because of the storm. 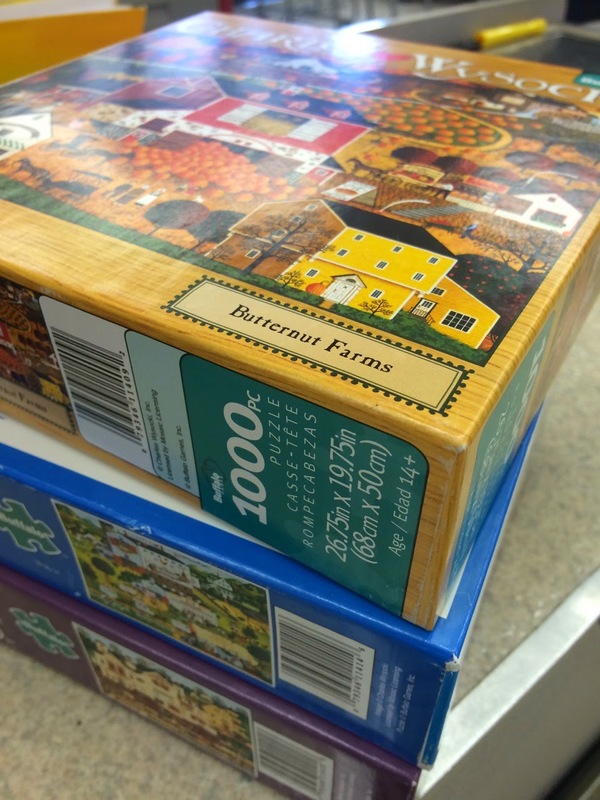 Kylie and I had been yearning for a puzzle to work on, so I said, “We could stop at K-Mart and get a puzzle after Taryn’s house.” “No, we’re not stopping at K-Mart for a puzzle.” Was the response I got. 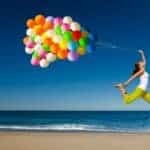 I let it go (we wives know when we should or shouldn’t push for unnecessary things, so I didn’t – I just sowed the seed). We stopped in, Sawyer showed us his room and the snow outside his window (he’s into showing us his room now, it’s so cute), talked with Taryn, and started for home. A couple miles down the road Jim asked, “Do you want me to take you to K-Mart to look for puzzles?” (Sometimes sowing the seed works.) Of course I said yes. We walked in the store, started down the aisle, and low and behold – what was right smack in the middle of K-Mart? Heaters. And plenty. “And you didn’t wanna stop here.” I chided. He chuckled. Of course, I reminded him that this was all my genius idea several more times before we were out of the store – him with his heaters, me with my (three) puzzles. I’m happy to report that two days later, the heaters had done their job, and the water pipe unfroze. Only now he thinks there’s a pinhole leak somewhere…that will be a project for another time. After the 2 1/2 feet of snow melts, I’m guessing. One day Jim went to the garage to get something out of the freezer, only to find it had stopped working and we were about to lose a couple of deer roasts (he is a hunter – he provides well for his family, and he would want me to say that). He immediately set to fixing them for dinner so we wouldn’t lose them, even though we’d had roast 2 days prior (yes, he cooks too, occasionally). Hey, if it means I don’t have to cook dinner again, I’m not complaining. I knew it also meant I wouldn’t have to cook the next night, because when we have a lot of roast left over he uses it to make his famous vegetable soup the next day. This broken freezer caused a win-win for me! Before you get all offended at the part about shooting the lemur, we don’t just go around shooting stuff over here in our little holler. I guess he perceived this so-called “giant lemur” as a potential threat to the neighborhood (since it was sticking it’s tongue out) and in his dream, he rationed that it would be a good idea to dispose of it. Dreams have a tendency to make the most absurd things seem logical. Speaking of wildlife in our neck of the woods, Jim noticed a few days ago that something had burrowed a tunnel from underneath our deck leading into the woods just a few yards away. There was much speculation about what it could be. “I think it’s a cat.” Declared Jim. “No way dad, it can’t be a cat, because cats hop, they don’t dig!” Argued Kylie. “No. It’s not a cat, a cat would hop on top of the snow like Kylie said.” I agreed. He spotted a little bunny the next morning using the path to skitter under the deck. Too bad the next snowstorm completely covered it’s path. We haven’t spotted it again. We also have a cat named Roscoe that visits us once or twice a week. I keep putting cat food out for him and the birds have decided they like it. He hasn’t come once during this whole storm, but I’ve fed the birds cat food every day. Who knew? 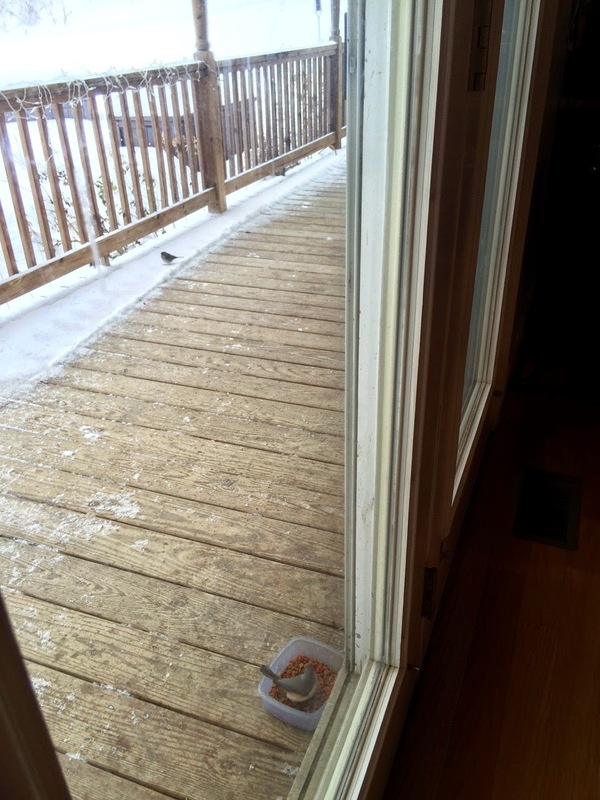 I guess when you can’t see the ground buried underneath all that snow, cat food looks pretty good to a bird. Yesterday I actually caught myself watching “Walker, Texas Ranger” beat up 3 guys for 5 minutes before I realized I must really be bored. During these eight days, I learned how to make memes. Here are a few. I captured a few moments of our day with Taryn and Sawyer. 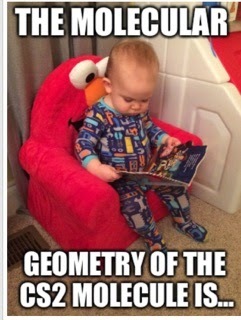 The child is a genius. He talks all the time and he has an answer for every question, even though we don’t know what the heck he’s saying. “We’re at the stage where he tells me something and I try to figure out what he’s talking about.” Taryn laughed. 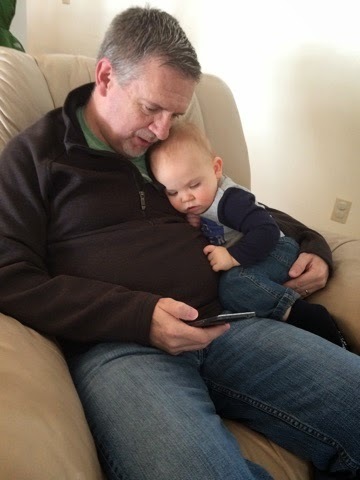 Riding in his car seat on the way home, he named every one in the car – “Papaw! Gigi! Ay-ay (Kylie)! 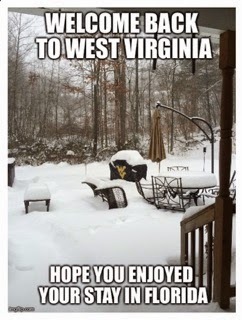 Mama!” Kylie said, “What if it was a state law that we had to make all the mounds of snow into snowmen. Like Kroger’s would have to make theirs over there (pointing) and Ryan’s would make theirs over here…” Sawyer saw her pointing and he decided to do his version of her story, “Ah yah, ya-ya, oh yah, yah, YAH! !” Pointing as he exclaimed. That’s not a bad idea Kylie has, either. 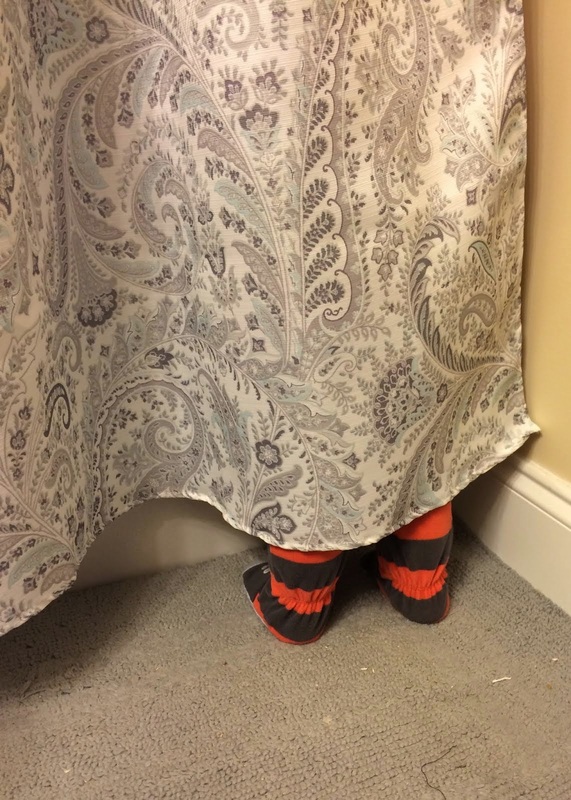 He was behind the shower curtain, staring longingly at the bathtub. He loves baths! 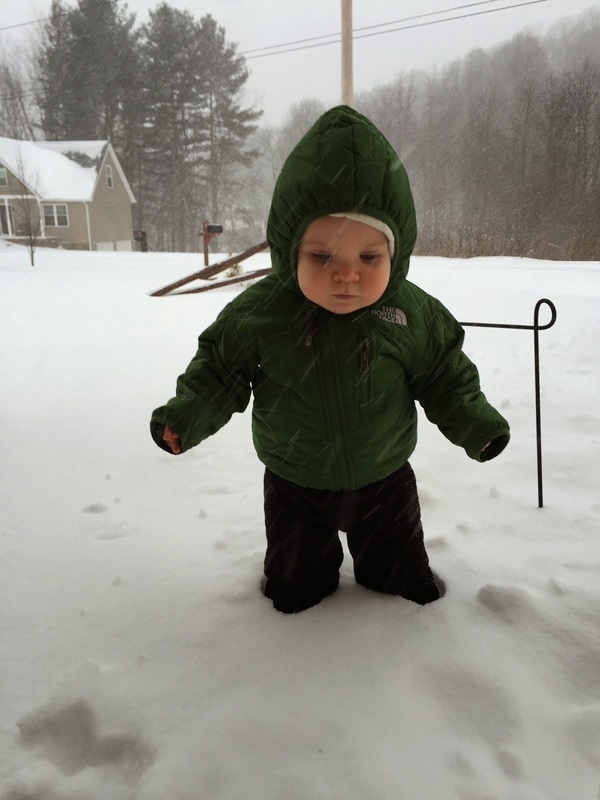 And then, he got to play in the snow for the first time in his life. At first he was a little stuck. 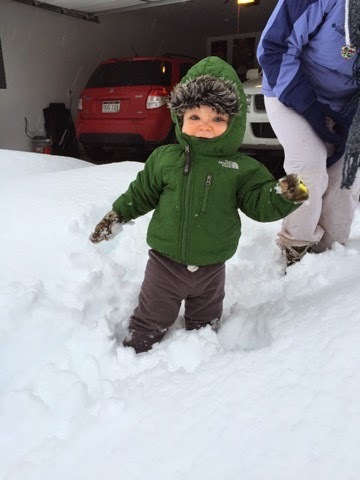 But then daddy did some shoveling and he went out to play. 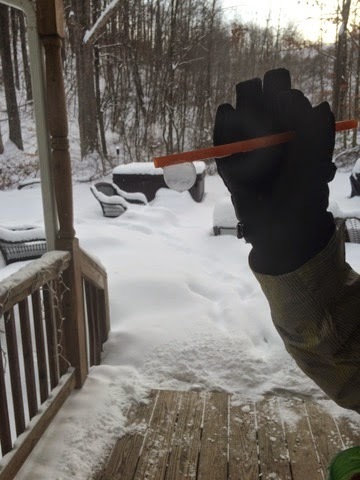 Kylie mixed up a concoction for homemade bubbles to blow outside when the temperature was in the negatives. Did you know? They freeze and turn into ice bubbles and you can break them! Also if you don’t have a bubble hicky-doo, you can use a giant straw. Snowstorms tend to make you inventive like that. 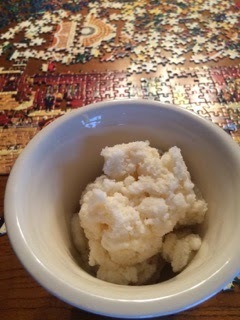 Yesterday (day 8), we finally decided to join the crowd on Facebook and make snow cream. It was well worth the calories. Also, you can see my “bird feeder” there with the cat food in it. Lastly, every night is movie night. Jim found Star Wars DVDs on sale a while back, so we are working our way through those. It’s an old family favorite – we had all the VHS tapes before those became obsolete. This is episode three (III). 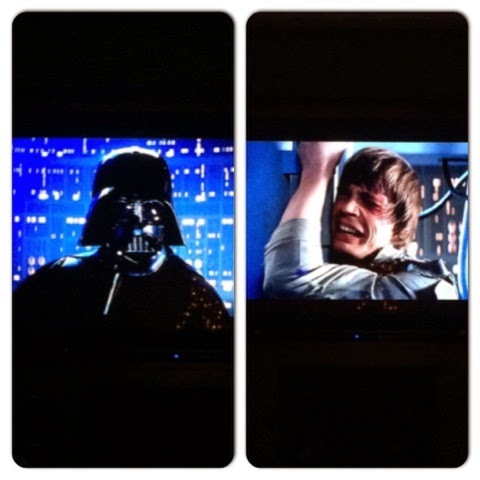 Darth just told Luke, “I’m your daddy.” As you can see, Luke’s not thrilled. I’ve also made a lot of picture collages, as you may have noticed. Today is day nine. 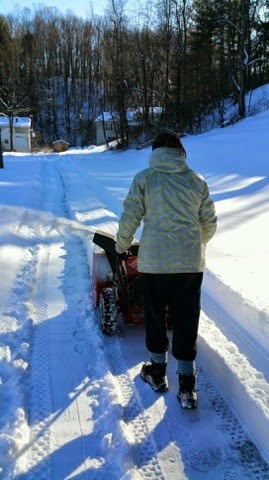 Jim is back out – you guessed it – running the snowblower. His goal is to get the driveway clear so we can reach civilization and some milk and popcorn (for tonight’s movie) sometime today. 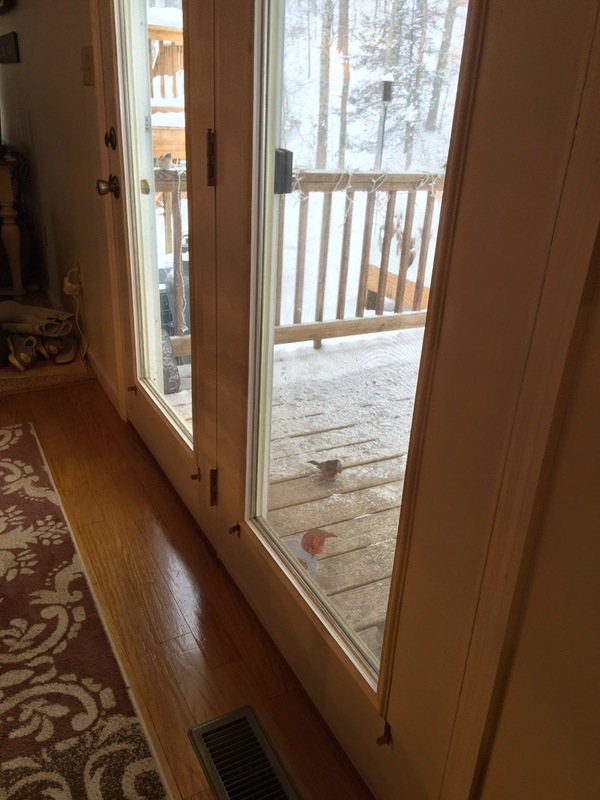 And oops – I just heard a bird fly into my back door window. Guess it’s time to put out more cat food. 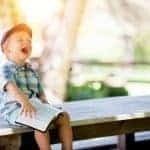 How to gain freedom from long-term habits with small wins!